I first worked with makeup artist Taylor Chang-Babaian, founder of krē•āt beauty, as an editor at Audrey Magazine. She worked with a slew of celebrities of all ethnicities, and she was of Asian descent, so I was excited to snag some red carpet secrets from her. Here, Chang-Babaian offers genius solutions to some of my most pressing makeup conundrums for my aging skin. Taylor Babaian. Photo by Albert Sanchez. Q. As I age, my eyelids start to sag and now my small double eyelid looks more like a monolid. I never had smudging eyeliner problems before, but now, by the end of the day, I look like a smoky eye gone wrong. What can I do without loading up on powder under my eyes (which then, of course, emphasizes wrinkles). Taylor Chang-Babaian: This is a very common problem. The best is to use a waterproof eyeliner and mascara. And not all waterproof eyeliners are waterproof. Try Chanel or Nars. Also, use waterproof mascara; Clé de Peau’s mascara is great. Anastasia also has a waterproofer that goes over your liner, which is kind of amazing. Q. I have a lot of Asian age spots all around my cheeks and cheekbones, the kind that is resistant to most over-the-counter treatments. When I try to cover them up with concealer, it just ends up looking ashy. I can’t get away with minimal foundation and powder because the discoloration is so bad and covers a third of my face. Any tips? TCB: Most people make the mistake of trying to cover up dark spots using really light concealer, which basically equals gray. I like to contour the cheek area with foundation or concealer that is two to three shades darker than my natural color. That does two things: It contours the area so that I get dimension and structure, and it gives me a little well-placed color. Use a color that has a slight peach or pink undertone ( think mixing light brown with one of the aforementioned colors). Color cancels out color, so getting the right undertone is essential. It has to be the same color level (think of the lighter areas of the face) or darker than your natural skin tone (like your cheek area), otherwise it looks like a light gray spot. Q. My face and neck are different colors (my bare face is much darker than my neck). I don’t like using foundation colors that match my neck, because then my face looks ghostly. Is my only choice to apply bronzer on my neck to match my face, and just live with the brown smudges on the neckline of my clothes? TCB: While it’s usually common for the face to be lighter than the neck, amongst Asian women it is actually very common to have a darker face. My theory is that often sunscreen can feel heavy so many Asian women opt out, which basically causes skin to bake in our own natural oils. The end result is a darker face. It is essential to wear sunscreen to minimize this issue. Today’s sunscreens are often made for acne-prone skin, and mineral sunscreens work great. They make the skin feel dry and can come in SPF up to 50. In the meantime, choose the lightest part of your neck, and use that as the color to highlight the face. Use your natural dark skin as the contour shade. Do not choose colors that are lighter than your neck or darker than your forehead for the most natural blend. Using two colors is essential for darker faces as using only one color makes you either look really dark or really ashy. 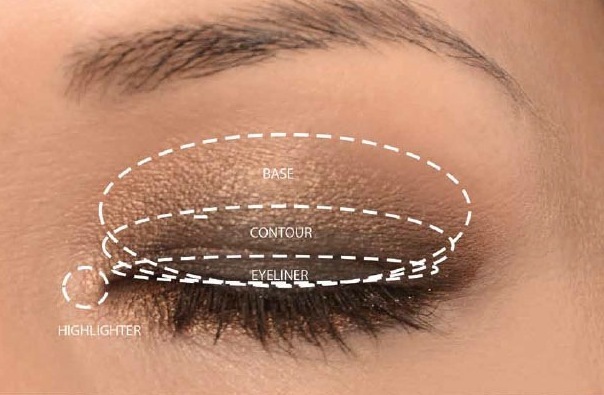 Highlight areas are the bridge of the nose, under the eyes, base of the forehead between brows and a mixture under the cheekbone area. Highlighting the center of the face creates dimension while minimizing the possibility of ashiness that occurs from trying to lighten the darkest areas of your face, i.e. the hairline and cheeks. Q. I have fine lines around my mouth and eyes, as well as enlarged pores. What kind of full coverage foundation is best for me, one that won’t settle into lines and blur pores? Any brand recommendations? TCB: Skin care is essential to minimize the look of big pores and fine lines. Make sure to exfoliate and moisturize daily; if you don’t, the foundation will look rough. Try a pore minimizer (Paula’s Choice, Lancôme and L’Oréal all have them and likely your favorite brand does, too). For foundation it’s essential to find one that is finely milled. It should look really smooth and not separate; you pay for consistency. My favorite is Clé de Peau — it’s really expensive, I know, but it’s worth it. Otherwise a fluid foundation that matches your skin tone like L’Oréal True Match or Shiseido Radiant Lifting Foundation. 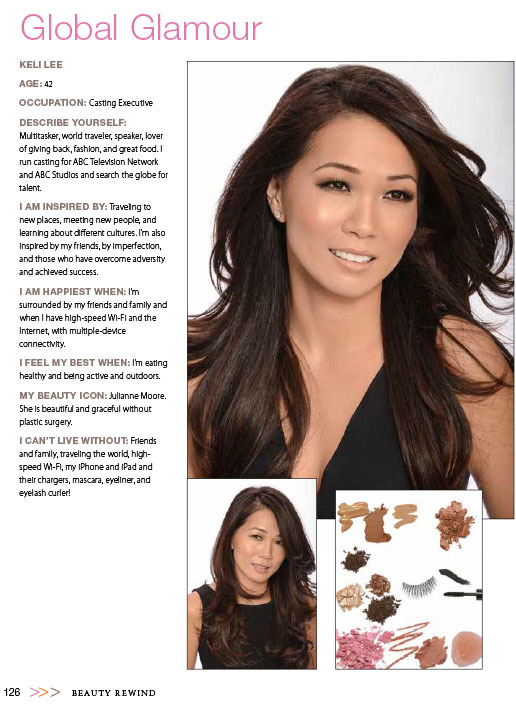 A how-to from Beauty Rewind, featuring casting executive Keli Lee of ABC. Q. What are some of your particular problem areas when it comes to makeup, and how do you address them? TCB: I actually have the exact same problems as you do. My biggest one used to be how to reapply sunscreen without taking off my makeup. Now I used powdered sunscreen. Colorescience has one that has SPF 50! Q. What’s a makeup or skin care trick that you do that most people wouldn’t know about? TCB: Exercise is really essential to the way your skin looks, as well as hydration and making sure you’re getting enough nutrients. Eat dark green vegetables and sweet potatoes — both great for skin. Q. For me, I feel like I suddenly started aging when I hit 40, and I’m still learning how to deal with it. What can women do to look and feel better, both cosmetically as well as in terms of lifestyle? TCB: I think the biggest thing that women don’t consider is that around 40, hormonal changes have a huge effect on the way you look, but more importantly the way you feel. I personally was hit hard by it, which is one of the reasons I wrote the book. For me, it was all mental, but it came from not taking care of myself. Sure, I took care of the way I looked, but not the way I felt. Eventually it caught up to me, and the way I looked was absolutely affected, but nothing compared to what was happening in my mind. Getting active was a life changer for me. It allowed me to spend time with myself and strengthen my body and my mind. Sleep, meditate, sunscreen and skin care every morning and night — all of this is essential for the health of your skin. And then relax about aging. You are not defined by your age. I ran my first marathon at 38, something I never thought I could do in my 20s. It’s important to take care of your body; it is an amazing machine that will respond to what you ask of it. Take care of your mind, and then you will want the way you look on the outside to reflect the way you feel on the inside. 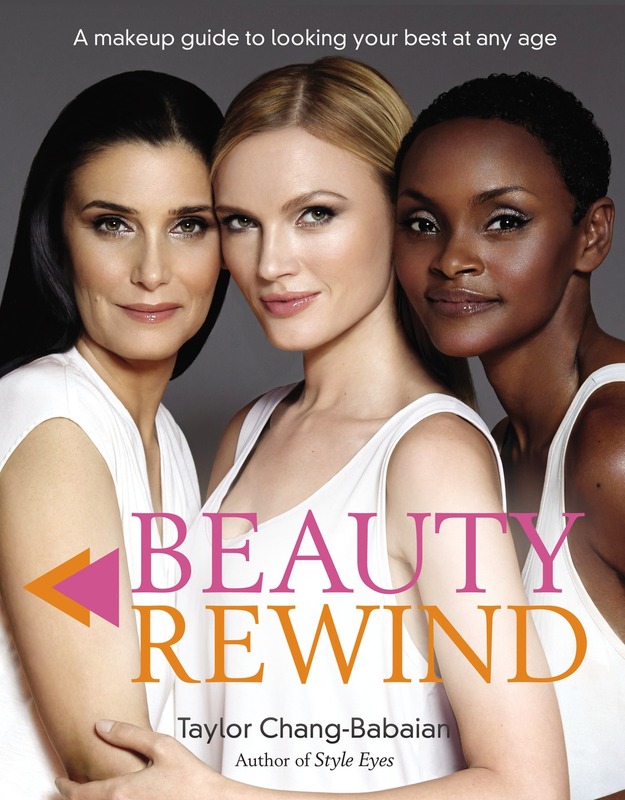 The paperback version of Beauty Rewind is available starting today.